Aadi Perukku Festival or Aadiperukku is a famous South Indian Festival, celebrated especially in the state of Tamil Nadu, India. Also known as Pathinettam Perukku, Aadi Perukku festival is celebrated on the 18th day of the Tamil month of Aadi (mid July - mid August). ‘Pathinettu Aaru Perukuthal’ in Tamil is later termed as Pathinettam Perukku. In 2018, the date of Aadi Perukku Festival is on 3rd August 2018. Aadiperukku festival marks the onset of monsoon in India which is expected to occur on the 18th day of the solar month, Aadi, every year. Adiperukku is celebrated near river basins, water tanks, lakes and wells, when the water level rises. Hence it is called as Pathinettam perukku. Pathinettu means eighteen and Perukku indicates rising. The rivers, Ganges and Yamuna, Cauvery and Gothavari are respected as holy rivers and these rivers are considered as a kind of female deities. This water-ritual is observed mainly by women in Tamil Nadu. The annual Aadi Perukku festival is celebrated vividly along the Cauvery basin in Thanjavur and Tiruchirapalli districts. Aadi month is considered to be the month for planting seeds and vegetation, as the raised water level paves way for the rice cultivation in the areas. Adi Peruku is also called as ‘Flood of the Eighteenth’. 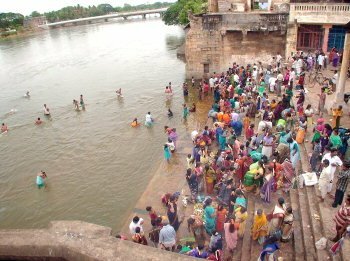 On this day, people offer chitrannam and perform abhishekham (ablutions) to the river goddess, Cauvery. You can see people lit special lamps along the river side. Another custom is that, during the month of Adi, the newly-wedded bride is brought to her parents’ home and made to stay during the month. On Adi Perukku, the bride is joined with her husband and sent back to her in-laws. The son-in-law is given new clothes, ornaments and sweets.